So I gathered these Rasmussen data (see, I can properly use a plural word! 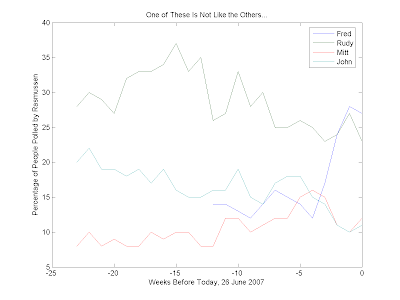 ), plotted them (above), and noted the general trends. The suprising thing I noticed, particularly after spending so much time over here, is that Romney has only outpaced McCain for the last four weeks or so, and even then, it has been a pretty much equal combo of McCain's campaign tanking and Romney's campaign taking off, rather than it being the result of either one's skill (or lack thereof). Moreover, it looks as though Fred! is having a fairly equal effect across the board in terms of lowering everyone else's numbers -- there's no obvious downward trend for one candidate over any of the others since he entered the race (unless you count McCain, but I think his failing campaign owes nothing to Thompson's success). But it's good to see FDT doing so well. If I get more time, I'll run some statistical correlation analysis on the data, and maybe get a feel for whose campaigns seem most inversely (or directly!) related to one another. I think Thompson's biggest challenge for the general election is to overcome the Republican base's overall disgust at their own Party. Fred may win the nomination, but then he has to convince Republicans, as well as some Democrats, that he's something different. Unless things change, there are a lot of Reps who will just stay at home in 2008, just like 2006. The fact that Bush and/or the RINO's keep selling out on things like immigration, war funding, prescription drugs, etc, may indirectly hurt Fred. There are times when I wonder whether Fred should be the one making a third party run, but then I get all confused, thinking about the many variables.